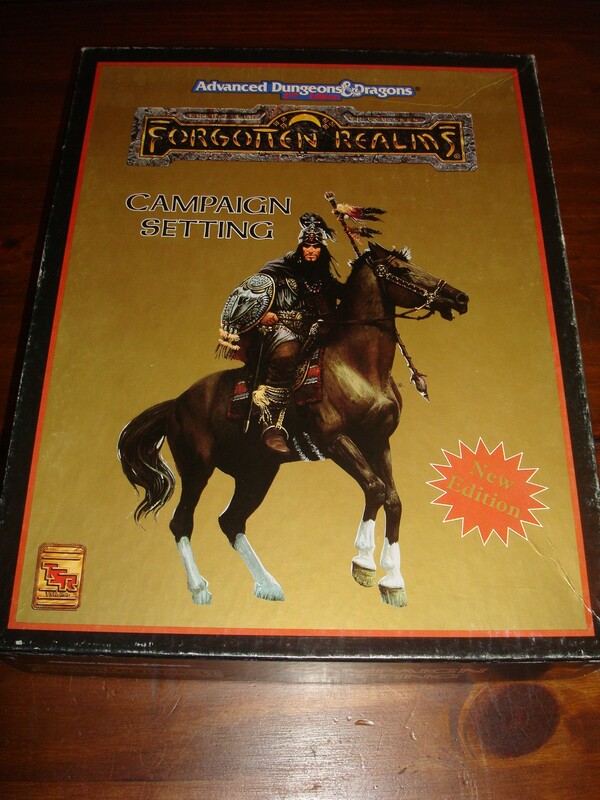 Continuing my series on classic boxed sets, we’ve arrived at my favorite (in my collection), the Forgotten Realms box for 2nd Ed. AD&D. Now, it’s important to keep in mind that this is not the old grey box released in 1987 for 1st Ed. 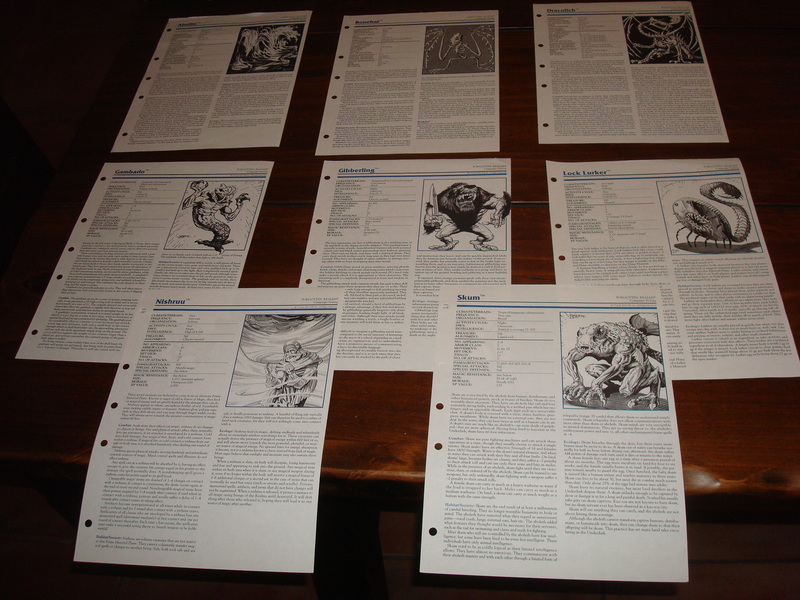 AD&D, but rather an updated version for the 2nd edition of the game. 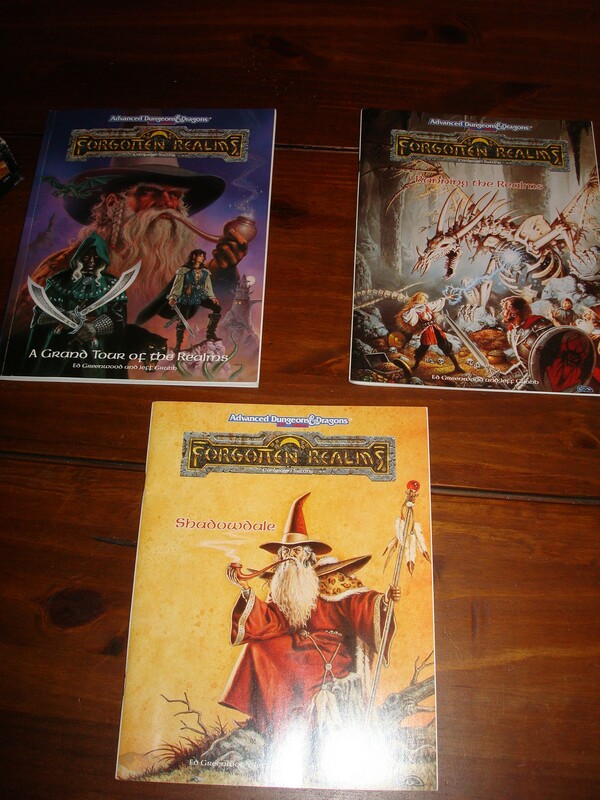 If I remember correctly, the Forgotten Realms Adventures hardcover book brought the Realms over to 2nd Edition after the Time of Troubles, albeit in a condensed manner, and this boxed set fleshed it out. Correct me if I’m wrong please! This boxed set was released in 1993 and retailed for $29.95! Less than the price of most modern role-playing books today. 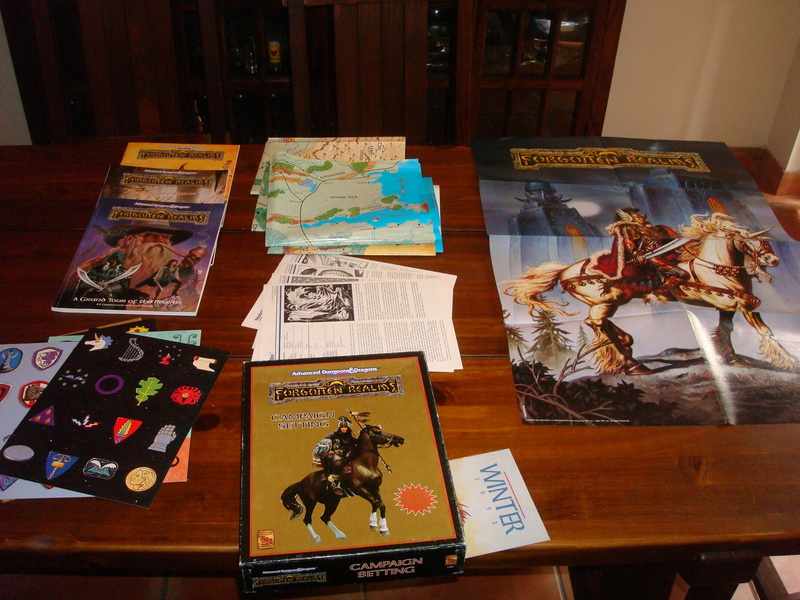 It is credited to Ed Greenwood for his original design of the Forgotten Realms, and Jeff Grubb for the actual design and development of the set. The boxed set assumes the campaign to start at the end of the year 1367 DR, 112 years before the current time in the 4th Ed. Forgotten Realms. 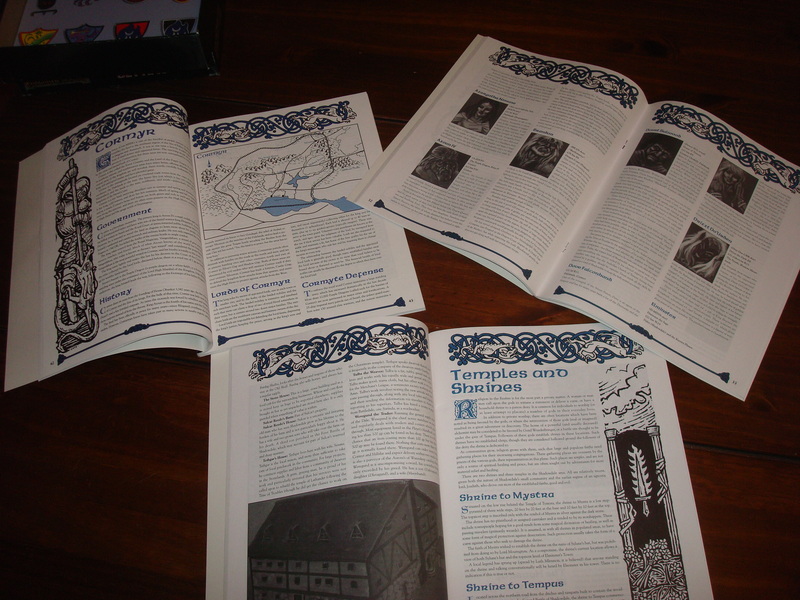 “A Grand Tour of the Realms” A 128 page book detailing the Heartlands, the Dales, Cormyr and Waterdeep. 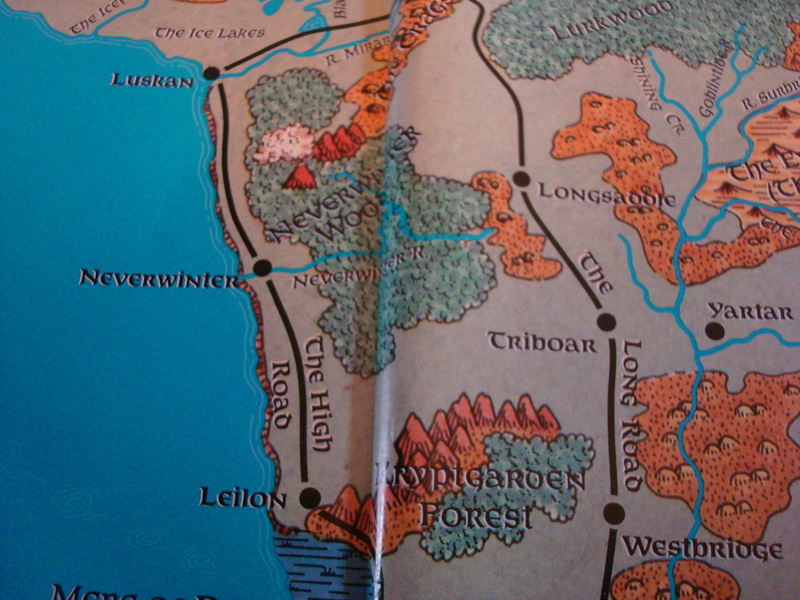 It also presents information about other locales in Faerun. “Running the Realms” This book is meant for the DM, showing us how to create campaigns for the Realms, along with secrets on the many NPC’s and deities that make up the setting. It’s 64 pages long. 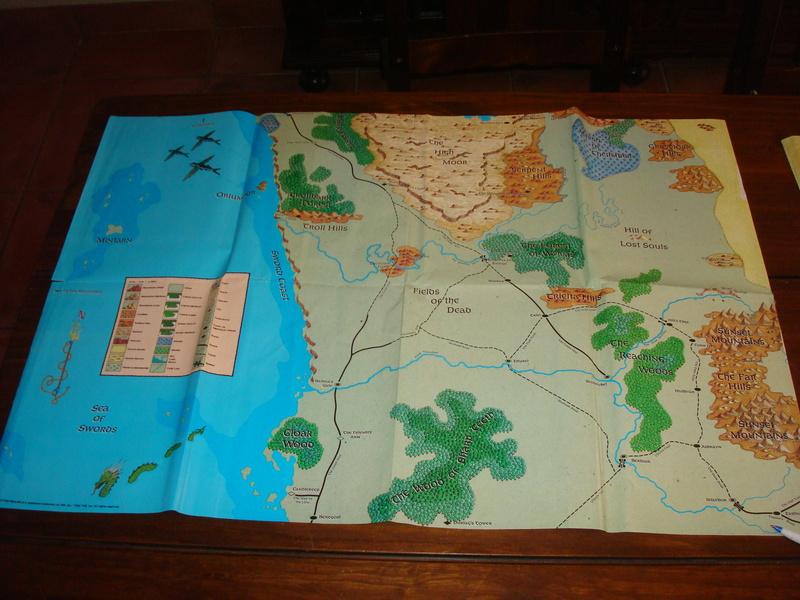 “Shadowdale” presents the city as “the most important town in the Realms” and assumes it as the start of a campaign. It includes an adventure titled “Beneath the Twisted Tower”. This book is 96 pages long. 8 Monstrous Compendium pages introducing several monsters of the Realms. 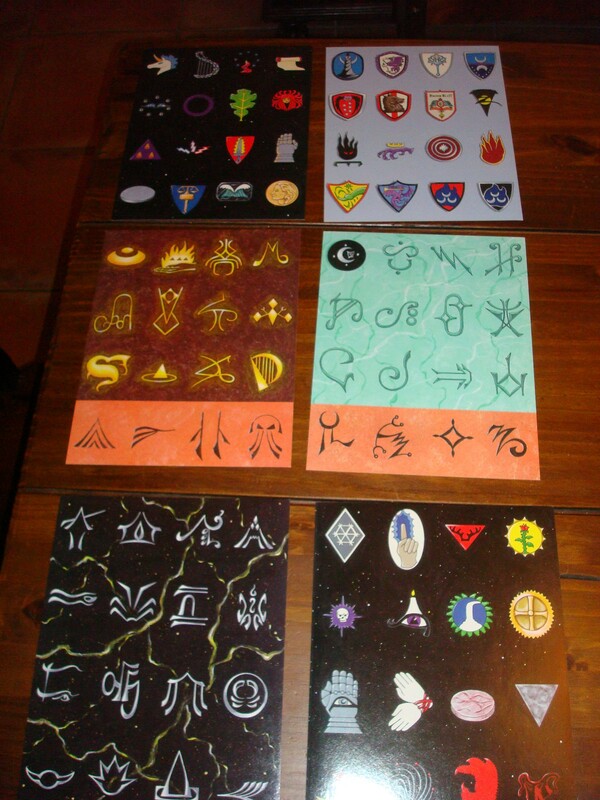 6 cardboard color sheets detailing sigils, symbols and glyphs of the Realms. 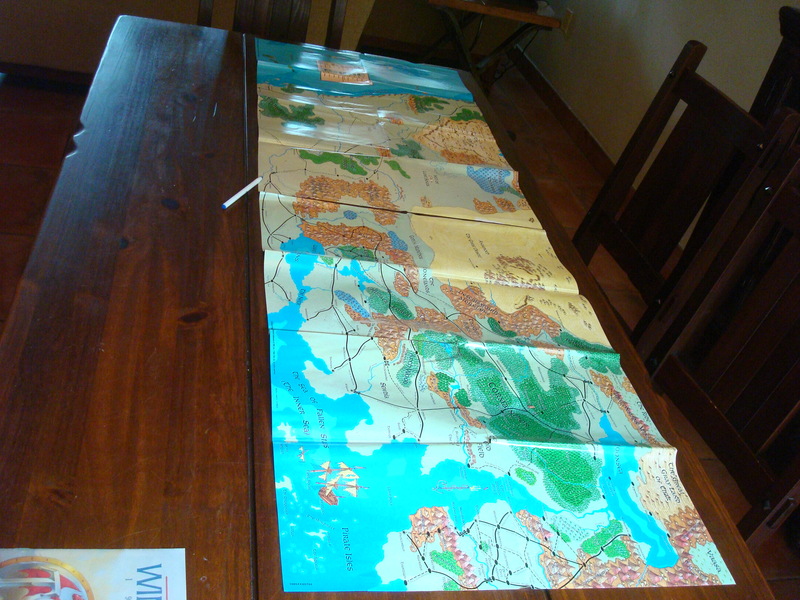 4 poster maps, two of eastern and western Faerun, and two smaller scale maps focusing on the Heartlands. Each pair can be aligned to form a bigger map. 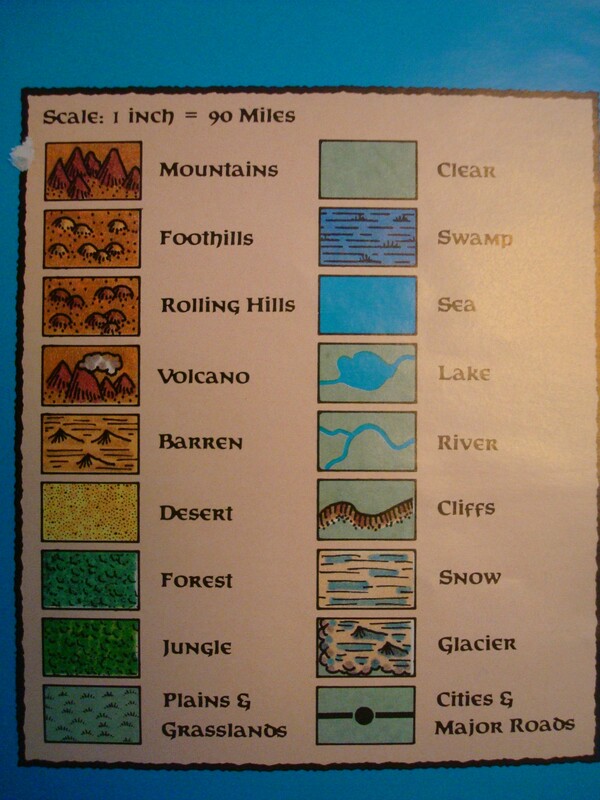 The large maps scale at 90 miles to the inch, while the zoomed-in maps scale at 30 miles to the inch. 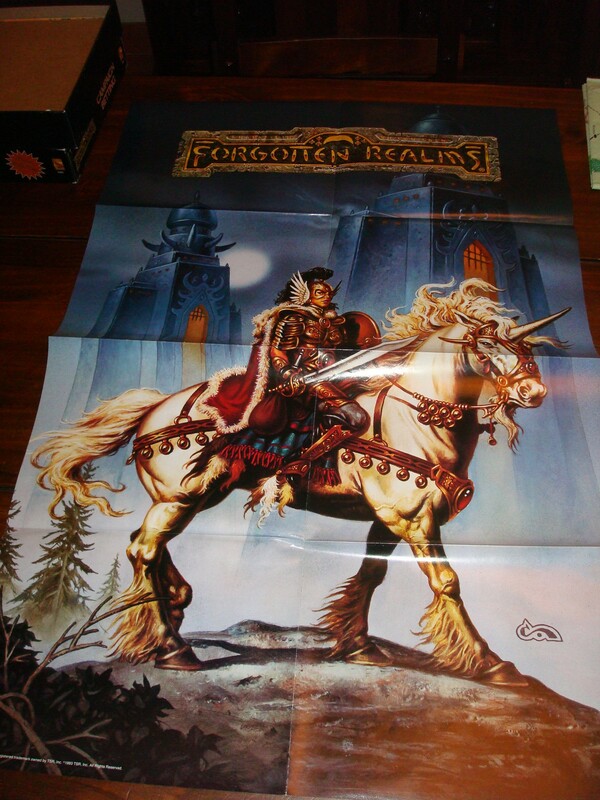 Full color poster by artist Clyde Callwell (it’s also the cover to the Forgotten Realms Adventures hardcover book). Transparent Hex overlay for the maps. I’ve lost my original copy, but made my own using transparencies and a laser printer. I hope you enjoyed this series! I am out of boxes sadly, so this may be the last one, unless readers out there want to contribute their boxed set pictures and descriptions to keep the series going. 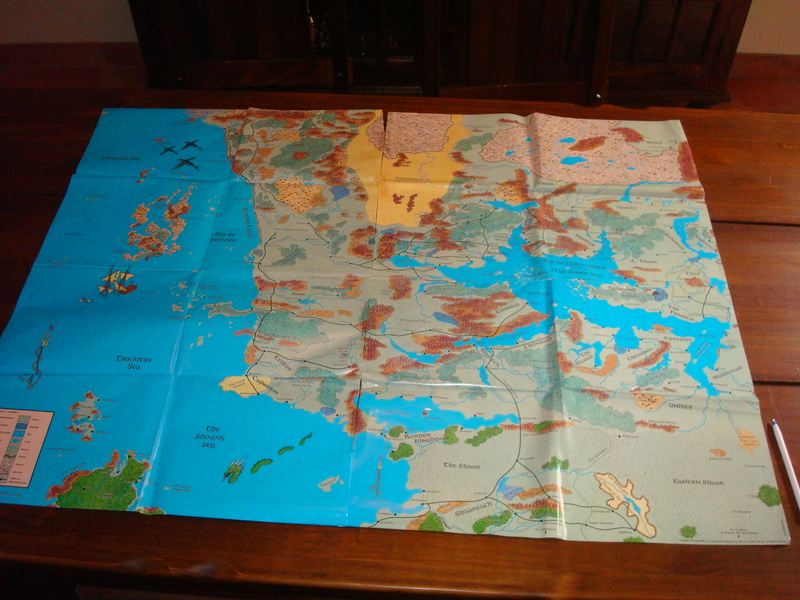 I have a copy of the 1st edition box set still sitting on my shelf, though without the clear plastic hex overlays for the maps. Those old sets are still great for sparking game ideas. Excellent! 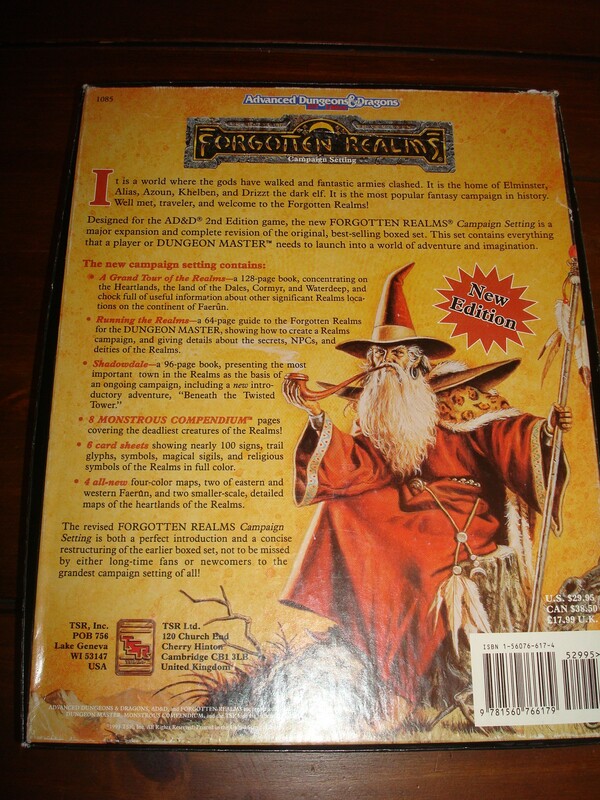 Love the FR boxed sets, slightly more partial to the 1st edition one, but fun to see the unboxing of this one as well! I love the Realms but this one was something of a disappointment for me – I was a big fan of the Old Grey Box and much prefer it. 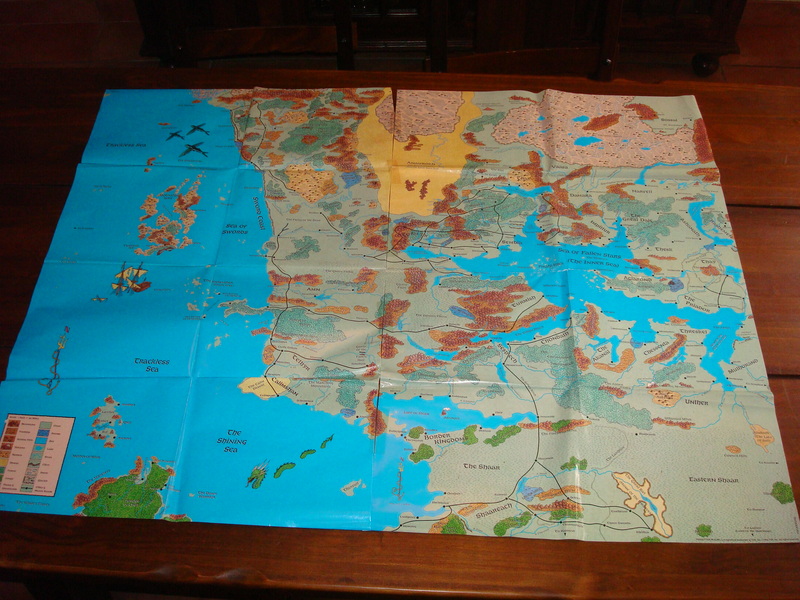 I’d be interested in seeing some info as to how the hex-overlay style campaign maps were used – as a DM new to 4E I’ve always found a lack of info on how to merge the micro encounter-driven gameplay with the more global world-driven one. 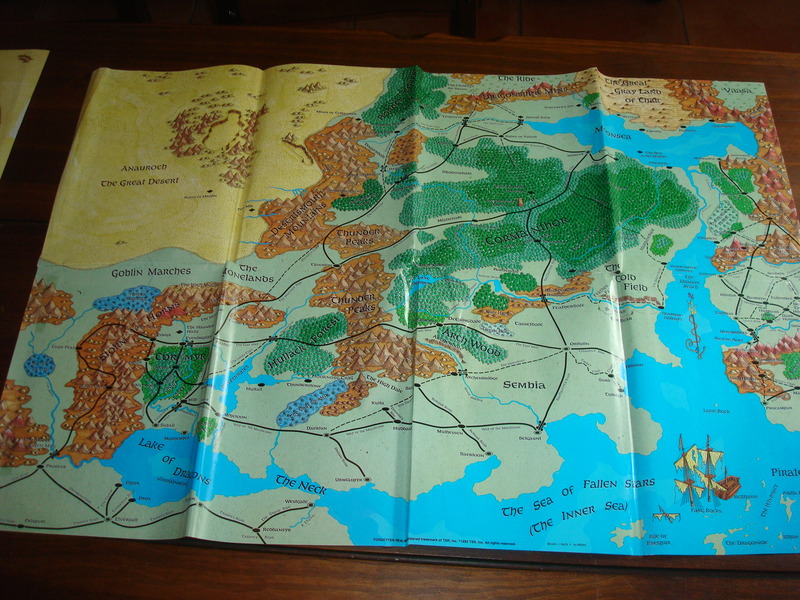 I had to use a pair of compasses to map out a route and daily travel-time for when my players wanted to travel from Loudwater to Baldur’s gate; and a hex-overlay and explanation of how to handle travelling from earlier editions would’ve saved a lot of guesswork and fudging on my part. There were I believe 5 hexes to the inch. 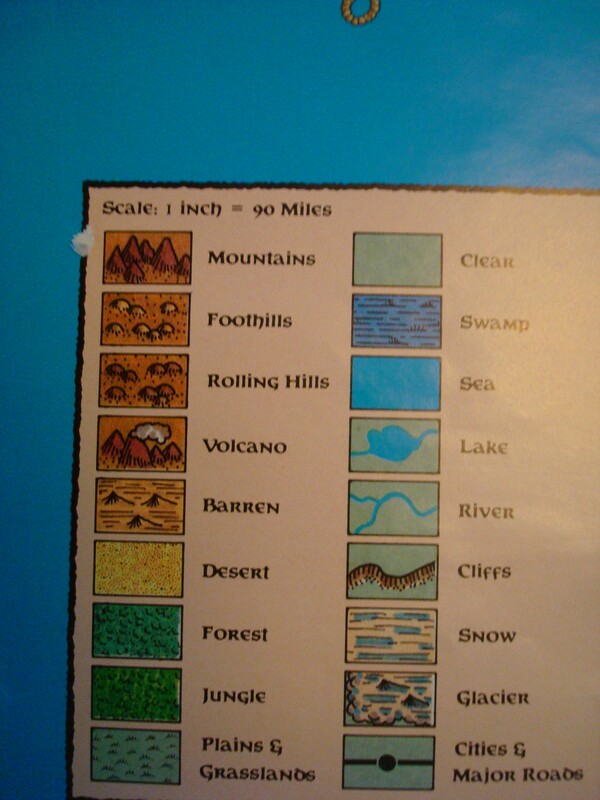 So in the zoomed in map, every hex was roughly 6 miles. 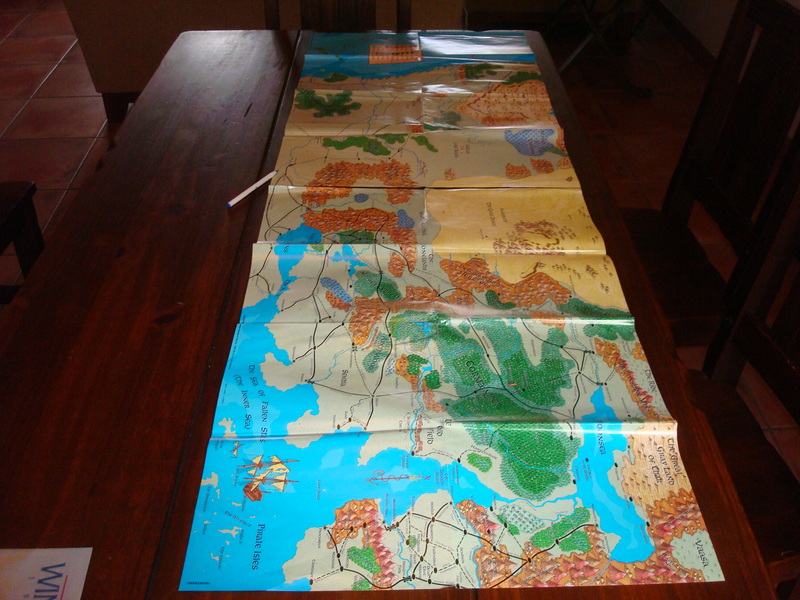 So you’d travel a few hexes each day, and the DM would roll for random encounters and such. 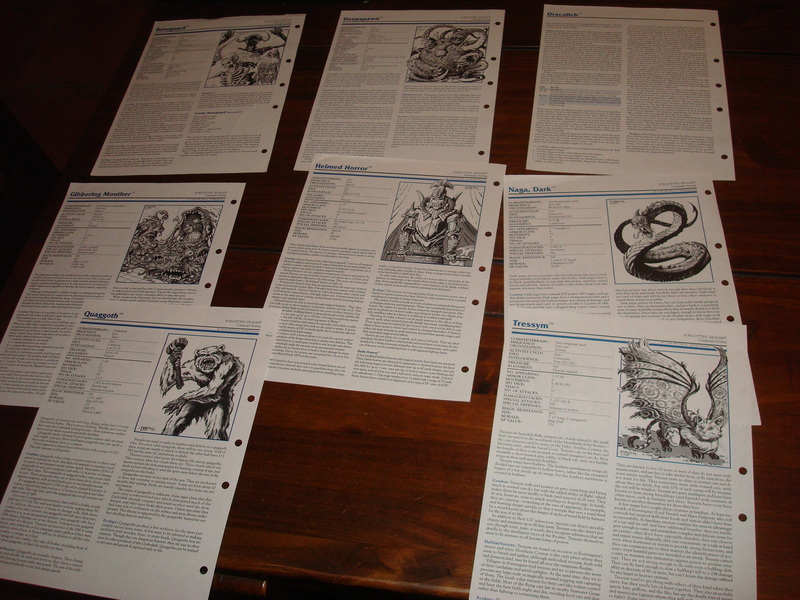 I don’t suppose you have any page / book references for how to to generate the random encounters, etc? I think I have some 2e PDFs knocking around, but really no idea where to start looking. I remember this setting so well. I was playing GURPS at the time and felt that this setting gave me so many stories to come up with. 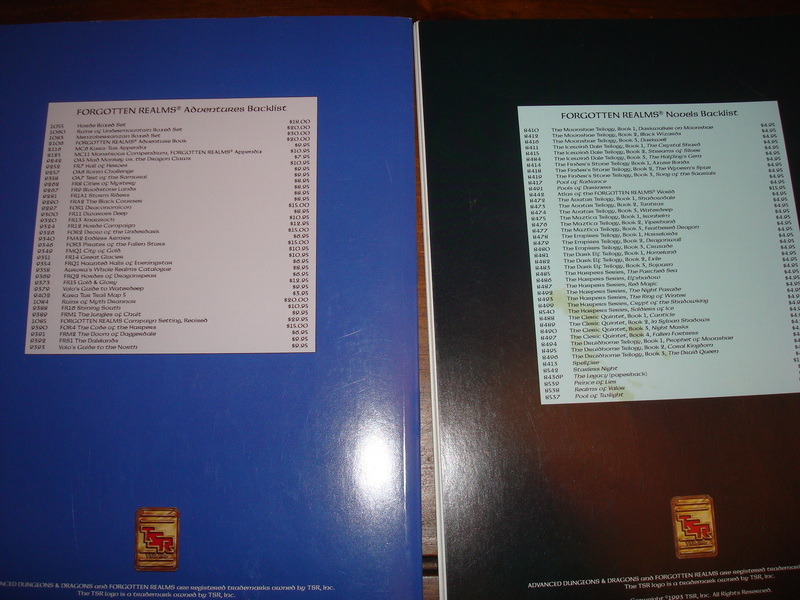 This was such a cool TSR product. I miss the times when you could open the box and smell the game goodness. Ah yes, that brings back memories. I had both the 1st and 2nd Ed. ones as a teenager and I had the world maps from one of them pinned to my bedroom ceiling so I could lay on my bed and look at it.